The impact of attachment disruption, even when in the best interest of the child, can be deep and profound. This course provides effective and encouraging strategies for resolving these challenges and bringing these children to their full potential as human beings. The material is useful for all those who are involved with transplanted children: adoptive parents, adoption agencies, foster parents, step parents, teachers, supporting relatives, social workers, psychologists, pediatricians. Transplanting children – whether this occurs as the result of remarriage, removal, adoption, parental loss, or change in custody - constitutes the most difficult challenge in raising children. Like plants, it is all about their attachment roots; unlike plants, it is a great deal more complicated. When proximity to one’s parent is neither possible nor in the child’s best interest, the child is subjected to the most impacting experience of all - separation from those to whom they are attached. When such children are unable to recover from the impact of the attachment disruption, or when they fail to adequately re-attach to the parent or parents who are raising them, nothing works as it should. Dr. Neufeld has dealt with transplanted children and the adults attempting to raise them for close to forty years. From his years of experience and his profound knowledge of attachment and human vulnerability, he makes sense of this most daunting of human challenges: raising children who were born to other parents. In this eight-session course, Dr. Neufeld shares his learnings and his insights. From this basis of understanding, he opens the doors to change. The objective of this course is to provide a map for all those who are involved with transplanting or transplanted children. to provide the adults involved with transplanted children with the insights and strategies needed to be effective in parenting and teaching them, and to support the families and educators involved. The course is conveniently divided into 8 sessions for study and review. Two days are required for delivery to groups at their location. Neufeld’s six-stage model of attachment is introduced as are the conditions required to fully develop the capacity for relationship. The construct of attachment depersonalization is introduced. An attachment problem checklist is presented for participants to use. The two main functions of attachment are introduced and expanded upon: firstly to render the child receptive to being taken care of, and secondly to foster growth and maturation. The child’s desire to “be good” is discussed as a function of attachment. The failure to re-attach renders a child resistant to care and oppositional in behaviour. The bottom line is that children need to adopt their caregivers. Six ways of fostering healthy working attachments are presented and discussed. These include: collecting, nurturing, inviting dependence, matchmaking, bridging and shielding. All adults dealing with transplanted children need to be familiar with the profound impact of facing separation. The separation complex consists of six major problems all rooted in unbearable separation. A problem checklist is introduced to help identify and diagnose the separation complex. Also discussed are strategies for reducing the separation that transplanted children face. Transplanted children often experience great difficulty re-attaching to their surrogate parents. One of the most significant problems is the existence of competing attachments that the brain deems critical for survival. Competing attachments may be fantasy attachments and have no relation to whether a relationship with the attached-to-person is in the best interests of the child. Three guiding principles for resolving and neutralizing these competing attachments are presented. A second major impediment to re-attaching is the reversal of attachment instincts caused either by hypersensitivity or by facing separation which is too much to bear. This defensive reaction has many faces and many triggers; its impact is devastating both for the child and for the caregivers involved. This defensive reaction also underlies a number of diagnosis common to transplanted children. Strategies are provided for defusing this challenging dynamic. Strategies are presented for reducing the wounding that transplanted children often face by the nature of both their attachment history, and their current attachment constellations. Transplanted children have more to adapt to, and at the same time are often less capable of adapting than other children. Participants are instructed on how to read aggression as a failure of transplanted children to adapt to their circumstances and situations. Strategies are presented for dealing with this aggression as well as for priming much needed adaptation. Transplanted children are often more difficult to discipline as a result of the dysfunction that results in the wake of a separation complex. The usual discipline methods often backfire with transplanted children as these methods depend upon processes that are typically arrested when children become emotionally defended against vulnerability which is too much to bear. Methods of discipline that are effective, attachment-safe, and developmentally sound, are presented. 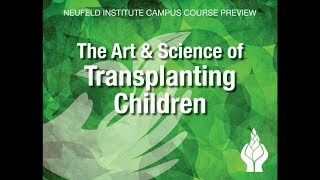 The tuition fee for taking The Art & Science of Transplanting Children through continuing education is $200. This includes a virtual campus student pass of four months to access the videocourse material as well as other supporting materials. If a personal copy of the DVD set is desired, the tuition fee is $275. Neufeld Institute Faculty member Genevieve Brabant is the coordinator for this course.